Home » Uncategorized	» I’m not feeding Se anymore. Here’s why. So, let’s get to the first tidbit from my nutrition class – I’m changing my vitamin E/Selenium protocol! We’ve talked about Selenium and Vitamin E before, so if you need a refresher, go here. Based on the results of Farley’s blood selenium test at the time of the tie up (low end of normal), I started supplementing vitamin E and Selenium (in an organic yeast form since I was told this was the safest and most effective form). Raising the selenium levels was my primary concern, and I starting giving vitamin E because on a dried grass/hay diet, she probably was not getting sufficient levels. Post-supplementation I’ve retested Farley several time with the results always reflecting an increase in Se levels – she is now in the top of the “normal” range. Her performance during endurance rides improved dramatically – I get A’s on muscle tone, she’s no longer as stiff, and I don’t get comments from vets that she’s moving “funny” on the hind end. Seems rather simple right? I corrected a Se deficiency and reaped the expected benefits. Organic Selenium is more bioavailable, HOWEVER the way it absorbs does not push selenium towards the pathway you want – for the muscle type disorders. It goes to an alternate pathway that can use Se, but is not essential (Se is one of several nutrients that can fulfill the requirements of that pathway) and has nothing to do with tye ups. If you feed organic Se, you will see a blood level increase, just like I did – however, because that Se is not going to the antioxidant/muscle pathway involved in the tye up, the blood level means NOTHING and is NOT helping. Even though inorganic Se forms are less bioavailable, it turns out that the Se that is absorbed in this form is the form that goes towards the pathway involved in muscle/tye ups. As a bonus, the inorganic form is cheaper too. So what about the changes I saw in Farley? The positive effects I was seeing (less stiffness, better muscle tone) was due to the VITAMIN E supplementation. Exclusively. Turns out that you can actually replace much of any needed Se supplementation with vitamin E supplementation. And since vitamin E supplementation is much safer than Se supplementation, this is what the nutritionist recommends. I was so shocked I actually confirmed this during class, and then spoke to her after class, just to make sure I had heard right. And I had. The organic Se wasn’t doing a thing, causing a false rise in blood levels and that vitamin E that I had been throwing at her by the handful is solely responsible. Apparently these facts are well known in the nutrition world. Sometimes you can do the right thing by mistake. In summary, if you are feeding Se to reap the benefits of it’s antioxidant activity in muscle, you have to feed the inorganic form. And there’s a good chance you can avoid Se supplementation altogether if you supplement vitamin E instead. I’m throwing out my selenium and just continuing with the vitamin E. Safer, cheaper, and simpler. Sounds good to me! I love it when nutritionist come and teach our nutrition classes to a bunch of vet students. Mostly there’s a lot of complaining and whining. Some checking facebook and mostly complete silence when asked questions designed to check our understanding. Since nutrition can be a bit dry (yes, even I, the nutrition junkie can admit this) with tables and charts and numbers and equations that may not be intuitive, I don’t necessarily blame my classmates (who will someday treat my horse and most of the time do an excellent job doing so. ). But as I looked around, realizing this was the last nutrition that many of us would have before going into practice, I wondered how comfortable I was taking nutritional advice from a vet? All throughout vet school I’ve heard how we (vets) should be the primary source of all things animal related – whether it’s traditional medicine, or behavior, or nutrition – and there’s lots of discussion what place non-vet animal “specialists” should have if any (behaviorist, non-vet chiropractors, nutritionists, trainers). To be fair, it seems like most of these discussions take place in the small animal world – with the large animal world being a more harmonious place where vets, farriers, nutritionists, trainers etc are expected to get along and use each other. However, what do you do when the various specialists you employ disagree on what should be done? Does one profession get to be primary over the rest? What do you do when your really good farrier insists he needs to nail on the corrective shoe for your foundered horse when your vet told him specifically it needed to be glued in order to not de-stabilize the foot? 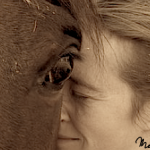 What about nutrition – a nutritionist is telling you one thing and your vet is insisting on something else – how do you decide what you will do for your horse? At this point, I am more likely to take nutritional advice from a nutritionist than I am my vet, if the two disagree. As a general observation, I see the vets-to-be around me more interested in fixing broken things. Learning about downed cows and treating disorders caused by nutritional imbalances is considered “clinically relevant”. Gross nutritional disease is certainly important. If I bring my horse in with equine metabolic syndrome, I want my vet to know to be knowledgeable about nonstructural carbohydrates and their effect on the syndrome, what hays tend to lower in NSC, and what steps can be done to reduce NSC in hays. But, there’s a whole ‘nother level of nutrition that goes beyond preventing or treating grossly abnormal clinical disease. What about optimizing performance now and preventing more subtle imbalances whose effects perhaps do not show up for another 20 years? To be fair, perhaps a very basic the level of nutritional knowledge is what clients want and expect from their vet. I’ve been on the observing side (as a boarder at a barn) of clients being told by the vet that they need to change from a 100% California alfalfa diet to something with more grass in it. “I’ve fed this way for 20 years without a problem!”, even though they are being faced with issues directly linked to that 100% alfalfa diet. Perhaps nutritional advice from a vet is seen as unsolicited (fix my horse doc!) and vets are seen as a provider of things that come the form of pills and bottles and needles. Management of the animals is a personal subject and an implication that management of the animals caused this problem can be seen as judgment or blame. Some vets, like feedlot vets, have a livelihood that is based on knowing nutrition really really well and they are the exception to the rule. But most vets seem willing to take what feed and kibble companies tell them, rely on AAFCO certification, and be content in a basic understanding of the gross needs of maintenance, growth, lactation to prevent gross imbalances in the diet. However I want to be the vet that is more focused on preventing problems before they occur, optimizing performance in a working horse, and optimizing quality and length of life in the geriatric horse from the day it’s born. Which means I want to be that vet who can answer nutrition questions competently, and be able to have a detailed conversation with a nutritionists without my eyes glazing over. And THAT’S why I love when I get a nutrition class taught by a nutritionist. 7 Responses to I’m not feeding Se anymore. Here’s why. Did you just say you wanted to be a horse vet? I feel like I prefer specialists for specialist knowledge 9.98 times in 10, but also like there a Venn diagram interaction between specialist knowledge and utterly convinced that their specialty is the cure for all ills…! That is _interesting_ about the selenium! Wow. Hey, as a vet of any animal I can have those goals! Not horses! :). The vitamin E substitution is really surprising. Thanks for sharing the information. Great post! The Se thing is fascinating,and I think you’re right about most vets only being trained to fix gross problems. We are told it’s really important that horses are fed at least 50 percent forage, that 100 percent alfalfa isn’t good, and that it’s important to look at copper, calcium, phosphorus, and the ca:p ratio in growing horses. I’m sitting there learning that of course, but then when I’m listening to the nutritionist, I’m also learning that small particles (like what is found in pellets) stick around in the horse gut and can cause gut acidosis (we will talk about this, but it’s bad) and this whole Se, vit e, vit b’s issue, and the fact that carbo loading creates fatigue walls during performance, and and and…..and I think these are really important concepts too!!! Another important thing that I forgot to mention in the post is that the vitamin that she recommended that I add before adding selenium was the vitamin bs. They have a function in muscling too. However, she said unless I had weak hooves etc that it probably wasn’t an issue – vit bs are manufactured by the microbes in the hind gut. Some are absorbed through the gut, and more is absorbed when the horse eats some of its feces. Hind gut microbes are made very happy by lots of forage, so if that is the mainstay of your horses diet it is likely you have happy microbes producing vitamin b’s and there’s no issue. Based in my feedback that I have a horse with great hooves and the improvement I saw with vit e, she didn’t think supplementation with Vitamin b’s was necessary in my case….but something else to keep in mind if you are having muscle stiffness and cramping. Very interesting! Growing up with parents who own a feed store, I’ve always viewed vets as not a primary source of info on nutrition because my parents went to classes and talks by top nutritionists and often heard exactly the opposite of what vets were telling their clients and plus having some friends who were vets, I knew they didn’t get a whole lot of instruction during vet school, so it’s good to hear that reiterated that vets aren’t the end-all-be-all, though of course there are some that know their stuff, like you seem to!